Before we start this part of the trip, I will define some terms and provide you with a brief overview of the road north from Fairbanks. Arctic Alaska was most recently developed in the early 1970s as oil was discovered in great quantities on the shores of the Arctic Ocean, in a number of oil fields collectively know as Prudhoe Bay. When the 800 mile long Trans-Alaska Pipeline was being built in the mid-1970s (coincidentally at $8 billion, the largest private construction project ever undertaken,) a road was needed to haul men (in the collective sense) and materials to Prudhoe Bay and to the various construction camps between Fairbanks and the Arctic Ocean. This road was originally known in Alaska as "the Haul Road," but its name was later changed to the Dalton Highway. The Dalton Highway begins approximately eighty miles north of Fairbanks, and is gravel (although as you will read, gravel in name only) for it's entire 414 mile length to its terminus at Deadhorse. The road was closed to general vehicular traffic until the early-1990s, and was used only by heavy trucks and other vehicles supporting the Prudhoe Bay oil fields. Although traffic is very light, you now find cars, RVs, some buses and the odd motorcycle or two mixed in with truck traffic. 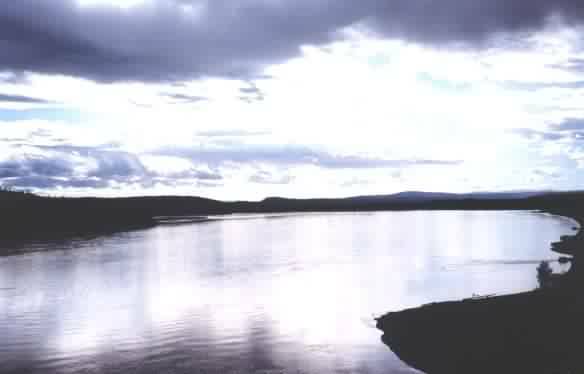 The Dalton winds its way through one of the most remote areas of North America and in its 414 mile length there are services only at the Yukon River Bridge (Mile 56, approximately 140 miles north of Fairbanks) and a Coldfoot, a permanent settlement 239 miles south of Prudhoe Bay, as well as at Deadhorse. Before you reach the Dalton Highway, you drive eighty miles north of Fairbanks on the Livengood Road, approximately half of it gravel. That makes the distance from Fairbanks to Deadhorse 494 miles, with only the first forty-four miles paved. Deadhorse is an oil community rather than a permanent town, and is the base of operations for the many companies that support the surrounding oil activity. It has a post office, general store, two gas stations and two motels. There are no permanent residents, although we talked to an employee at the hotel who had not left Deadhorse for two years. We quickly determined she was not of sound mind, as the sun doesn't rise in Deadhorse for almost sixty days in mid-winter, and temperatures including wind chill factor commonly reach 100 degrees below zero. Last night over a good Italian meal in downtown Fairbanks our collective mood was mellow from camaraderie developed over the past days, from relationships renewed, friendships rekindled, or perhaps from the fine Merlot. The sky was clearing, and at 10 P.M. with the summer sun still high in the sky on a balmy evening, we made our way back to our bed and breakfast. We were down to the last few days of our push north to the Arctic Ocean, the goal set for this trip. 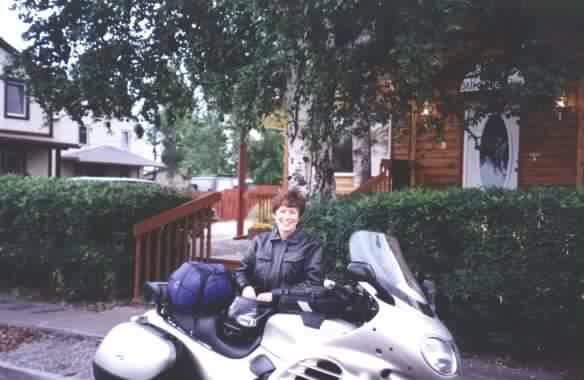 But the joy of the moment was tempered by the realization that four of us were about to undertake the 500 miles of riding necessary to get to Prudhoe Bay. We had been warned, again and again. You won't make it, said many. Grizzly bears hang around the road just waiting for unsuspecting tourists, we heard. The mud is too deep when it rains, and the dust envelops everything when it's dry. Trucks throw rocks as large as melons. Do you know you need to carry two spare tires? Are you aware there is no gas or other services for 240 miles? The latter was not a question, but clearly a statement of derision that we would tackle such an adventure on motorcycles. Even the bike dealers, who were generally more reserved in their criticism, swore the sidecar didn't have a chance. Yes, we knew. I had done my research and so understood the road conditions and where services are available. I had talked to truckers and other bikers. It could be a tough trip, but I was sure barring extreme mechanical problems, that we would make it. Still, negativity takes its toll. As noon approached, our scheduled hour of departure, doubts crept in. The Dalton had 12% grades in places. If it was wet, could I keep the Cavalcade upright on the downsides I wondered? Should we be taking spare tires? Although we all carried patch kits, I didn't even carry inner tubes for the Cavalcade. Would our tires hold out? Julia left for Denali National Park, dampening our spirits even more. We had come up as five, but only four of us would tackle the Dalton. I knew that given her bike and riding experience she had made a good choice. Should we all be headed to Denali with Julia? Julia prepares to leave for Denali Park. Lovely All Seasons B&B in the background. At 1 P.M. we pull out of Fairbanks under a light drizzle. The National Bank of Alaska's temperature sign reads forty eight degrees – this is the end of July? Eric takes the lead as we head north first on the Steese Expressway, a four-lane highway to the town of Fox and it's population of 200 people. Some politician's pork barrel project to be sure. Twenty miles north of Fairbanks we see a sign – "no services next 118 miles." Around the next curve there is no reminder of human habitation, other than the road, in any direction. Just endless vistas of northern forest. We are on our way to Prudhoe Bay. At Mile 44 the pavement ends and the gravel begins. The road twists and turns, gets narrower, and surely will end at a trapper's cabin in a few miles. It's unfathomable that this road continues north for 500 miles. I pull up beside Jan after a particularly nasty stretch, in the stinging rain. "Do you really think I can make it, she asks?" I assure her she can and we carry on. We continue the remaining 84 miles into Yukon Ventures, a motel/gas stop where the highway crosses the Yukon River. As we turn into the parking lot I almost put the Cavalcade down – the surface is hardpan covered by two or three inches of gooey, slippery mud. By the time we pull up to the cafe entrance, 150 yards away, our bikes, shoes and pants are covered in this brown mess. Afraid it will set up around the wheels and brakes, we spend a half-hour digging it off with screwdrivers. 11:00 PM, July 28, 1999. The Yukon River passes under the Dalton Highway. We do our best to clean up before we eat our $9 hamburgers. The room, measuring 7' x 8' is $100, but who can complain since it includes the use of the bathroom and shower at the end of the hall? Beside, it's the only accommodations in the 260 miles between Fairbanks and Coldfoot. It's primitive, but we knew that when we started. We've come over 2,600 miles since Seattle.